At Top Knobs, we take great pride in our tradition of providing fine craftsmanship, innovative designs. and a wide variety of products from which to choose. 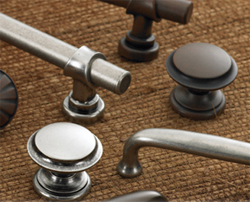 Our website features an extensive selection of knobs and pulls for all tastes and decor motiffs. Take the time to browse our site and examine all of our beautiful and unique designs and collections. We think you’ll be pleased with our mix of traditional and modern decorative hardware. Our craftsmen manufacture our knobs and pulls using a blend of traditional craftsmanship and advanced production methods. Our attention to detail ensures that our products look and feel individually made rather than mass-produced -whether we manufacture just a few pieces for a custom kitchen, or thousands of pieces for a large manufacturer.